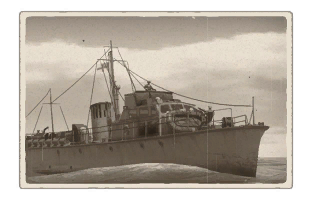 The Fairmile A (ML100) is a rank I British motor gun boat with a battle rating of 1.7 (AB/RB/SB). It was introduced in Update 1.83 "Masters of the Sea" along with the British fleet. The Fairmile A has little to no armour, therefore a few good shots to the engine and ammo rack will make quick work of the Fairmile A. The Fairmile A has a crew of 14, which is small compared to the Soviet OD-200 and the German R-boot R-41. In terms of survivability, it is best to stay at a distance of about 1.40km from the enemy, so you're just out of reach. But you don't want be to far otherwise you wont be able to hit the target with the 3 pdr armament. The Fairmile A has a top speed of around 37km/h. It is fairly slow at turning. 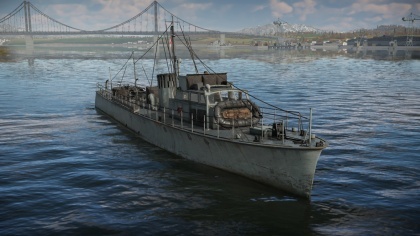 Since the Fairmile A has a low top speed, it is hard to catch up to the more agile motor torpedo boats, but you should be able to catch up to similar ships such as the Soviet OD-200. The primary Gun is a 3 pdr QF Hotchkiss cannon. It is very slow at reloading and has a slow firing rate. It cannot fire towards the front of the ship, only from the sides or rear of the ship due to its positioning. However, the 3 pdr is capable of taking out motor torpedo boats and other ships. The 3 pdr has a high explosive (HE) shell, of which a single shot can destroy a motor torpedo boat at close range if you aim for the engine or ammo rack. In addition to the 3 pdr QF Hotchkiss cannon, the Fairmile A (ML100) has three turrets with dual-mount 7.72mm Lewis machine guns. They are capable to destroy lightly armored motor torpedo boats and enemy planes. The best way to use this ship is to take out other slow moving ships with the 3 pdr gun. The main gun fires very slowly and is slow to reload, so its best to switch to the Lewis guns scattered around the ship to take out any approaching boats. Watch out for other motor torpedo boats that are approaching, as this boat is a bit slow so they will hit you with torpedoes if you don't shoot first. Boat is a bit slow. Talk about the history of the creation and military application of the ship in greater detail than in the introduction. If there turns out to be too much historical information, put it in a separate article, taking the link to the vehicle article and adding the “/historical” block to it (e.g. https://wiki.warthunder.ru/Vehicle-name/historical) and add a link to it here using the main template. Links to sources must be provided at the end of the article. This page was last edited on 20 February 2019, at 03:08.